"My name is Tove Cecilie Fasting and I run Kairos Garen Villas and our big, fat Greek restaurant Ankyra together with my Greek husband Christos. When we first started talking about building guest rooms and opening up for tourists, it was clear to me that I didn't want to run just an ordinary hotel. One reason is that the location of the village and our property invite to peace and contemplation, another reason is that I'd like to create the kind of place I'd love to visit myself during my holidays: A place where you wind down, find inspiration and get refreshed - and in addition maybe even leave with some new knowledge. Our hotel is the first and only accommodation for guests in Eleftheres. This area of Greece has a lot to offer, but high unemployment, poverty and the flagging out of traditional industries have created a pessimistic outlook amoung many people. By bringing tourists here, which means more activities and new jobs, I hope making my tiny contribution to the local society in this beautiful part of Greece. I have been living in Greece permanently since 1993, but first sat my foot on Greek soil in 1984. I loved the country from the moment I stood in the door opening of the airplane and felt that hot air greeting me. And I still remember how magic I felt the taxi drive into Athens city was - the chaos, all those white ugly buildings, the flat roofs with their forests of television antennas, the huge advertisement poster and street signs written in a letters I barely could read." Kairos Garden is a small family run hotel that actually consists of two villas: Villa Kalypso and Villa Lotus, in addition to our garden restaurant. Kairos Garden is situated on the outskirt of the village, a few minutes stroll from the bakers, grocery stores, butchers, coffee shops, pharmacy and bus stop and forty minutes from the airport of Kavala. 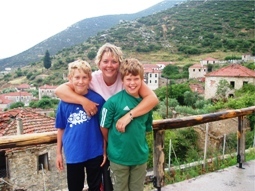 Villa Kalypso is also our family home. My husband Christos and I and our two boys live on the ground floor of the villa while we rent out the rooms upstairs to guests. The guest floor consists of three bedrooms (two double rooms and one bedroom with one double and one single bed), two bathrooms, open living room/dining room/kitchen (the kitchen is very basic). All rooms have big balconies. You have the possibility to rent only one room (but be willing to share bathrooms with other guests) or the whole floor - ideal for a big family or a group of friend on holiday together. 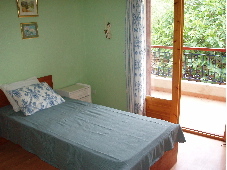 Villa Lotus consists of two studios, both with a bedroom, a small kitchen and bathroom. One studio has a double bed, while the other two single beds in addition to a small sofabed in the kitchen (sleeps a child or a small grown up). In Greek mythology Kalypso was the nymph who saved Odysseus from shipwrecking when he was trying to get home after the Trojan war. She took great care of him, fed him the most wonderful food and wine, and made sure he had a great time on her island. When he wanted to leave to get back to his beloved home at Ithaka she helped him off. Villa Lotus is named after the land of the Lotus-eaters, where Odysseus and his sailors also spend some good time. The balcony outside the kitchen has shade in the morning and is the perfect place to enjoy your morning tea or coffee. In the kitchen you can make yourself tea or coffee or a simple meal. 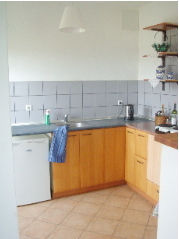 The kitchen is equipped with a cooker, a water boiler and a fridge. I doubt you will want to spend much time in the living room in the summer, but on a chilly night in spring, autumn or even winter it's nice to crawl into a comfy chair with a good book. Choose one from our library if you want to and don't worry about finishing it before you leave - you can take it with you and, if you want to, leave another book here. Good litterature should be recirculated! As the house has central heating and a there is a fire place in the living room, Villa Kalypso is also a wonderful place to relax during winter. Both the bedrooms on the back side of the house have two single beds. 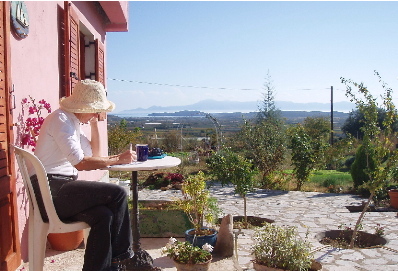 The rooms share one big balcony with views to our neighbours olive grove and fig trees, as well as the mountains. Our son Jason drew the monster in the niche above the bed some years ago, and I think it would be a shame to paint it over! The monster room has one double bed and one single bed. 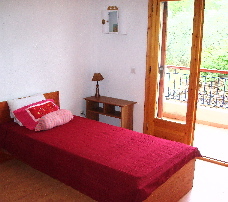 The room has a balcony with view to the garden, the fields and the sea. There are two bathrooms. The main bathroom even has a balcony so you can brush your teeth while enjoying the view towards the village and the mountains and listening to the birds singing. Our hotel is perfect for families with children. The villas are situated in the big garden, with a climbing frame/castle, our own organic vegetable garden, tiny vineyard, chicken yard and our family run taverna. It's a short stroll to the bus stop and a few minutes on the bus takes you to some of the best beaches in Greece. The bus stops practically on the beach (actually on several beaches on its way to town) so you don't need to walk (carrying kids and all their beach toys! )long distances in the heat. Of course, it's also possible to hire a car if you want to explore this fascinating region of Greece. 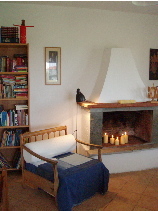 Wellness is also a part of your Kairos holistic holidays. Your vacation is the perfect occasion to treat yourself to something special - whether it's a Ayurveda therapy, pedicure or a mudbath. We are co-operating with great local therapists in different fields. Ankyra, my big fat Greek restaurant, is beautifully situated in the garden of our holistic retreat in Eleftheres, Kavala, with the same stunning views as from your holiday villa. This is a traditional Greek family taverna where we aim using high quality ingredients and organic vegetables from our garden, as far as possible. We want you to eat well and healthy during your holidays with us! Don't expect wheatgrass and raw food, though -on the menu are grilled meat, fresh fish and vegetables dishes of the season - in addition to today's dish, which is inspired of what ingredients I have available. In the winter my big fat Greek restaurant is cosy and warm with huge logs on the fire place, while while in the summer you sit outside under the star specked velvet sky with all of the kampos field, of Eleftheres in front of you. I love to make food, but it is a challenge to make villagers try something slightly different than what they are used to. And even though I've lived here for fifteen years they're still slightly surprised that a foreigner can cook Greek food! I think I've managed to make an impression with my Greek meatballs, soutzoukakia smyrnaika. My pork roll is also popular, though I never tell customers it's a traditional Norwegian recipe - I'd scare them away. Besides, if the food is good it has to be Greek. I'm sure you know that pizza actually was a Greek invention? Our menu varies with the season and what's available when. I constantly try out new recipes and if husband and kids are alive after the guinea pig experience I'll serve it in the restaurant, as well. Normally a full meal with table wine (or tsipouro - the local ouzo) will cost 10-15 euros pr. person. I'm happy to offer Greek cooking lessons our guests at our retreat. Here you'll learn to cook traditional Greek food. The cooking lessons can be combined wine tasting and a tour in the local vineyards. Lessons take place on Fridays, as we'll start with a visit to the Friday market in the small neighbouring town Eleftheroupolis. The village of Eleftheres has only 2000 inhabitants, but it's still one of the most lively villages in this area. Along the main street that cuts through the village are grocery stores, coffee shops, a bar, butchers, bakers, pharmacy, church and school. Even on an ordinary weekday night you'll find villagers strolling the main street or enjoying a cup of Greek coffee in one of the many traditional Greek kafeneia. The beaches in Greece are world famous and not without reason. But the beaches of the municipality of Eleftheres , Kavala in northern Grece are really the best of the best: Crystal clear, turquoise waters, long, sandy dunes, no dangerous streams or any other dangers � what more can you ask for? Another advantage is that they are easily reached from our retreat - a few minutes by car or bus. Ammolofoi, meaning sand dunes or sand hills, are actually the name of several beaches, starting from the ruins of the Byzantine castle in Nea Peramos � its one, several kilometers long stretch, the different bays are broken up by parts of rocks. If you don't have a car you'll go by bus to Peramos and then walk along the sea - it's a beautiful stroll that will take about 40 minutes - or arrange with me to take you there by car. In the high season (July and August) there is a bus from Kavala and Peramos to Ammolofoi. The waters are shallow for a very long bit before it becomes deep, making it a great place to for kids and also grown ups who want to play in the water. There are fishes here and it can be fun to snorkel, or even to go fishing from the rocks. The sand is very fine. Breakfast: Breakfast is optional and can be served at the time that suits you. The price pr. person is 6 euros and includes bread, marmalade, cheese, butter, egg (from our chickens! ), juice, coffee or tea. Open: All year - actually, this area is also great for a winter vacation. Pets: They are allowed as long as you thrust they get along with our dog and cats and otherwise behave nicely! Restaurant: Open every afternoon from approx. 6pm and for breakfast upon agreement. 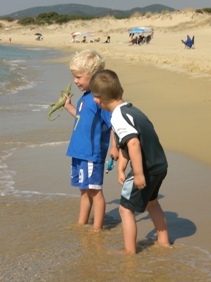 Open mornings in Greek school summer holidays (from June 15th to September 10th). Closed on Mondays. Pilates, yoga, walks, massage, visits to healing mineral and mud baths, healthy food - this week is a holiday that contains everything you'll need to boost your energy and feel more fit. Booking deadline April 15th. A week of Greek cooking, food and herb exploration, visit to vineyards and wineries, as well as wine tasting. 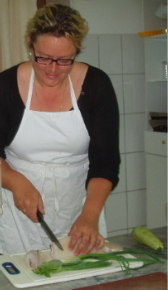 Tove is a published author of several books on Greek food and wine. Booking deadline July 5th. Tracy will teach you everything you need to know to write your own bestselling novel - from building a plot and developing characters to pacing and editing. Good English necessary, but non-native English writers welcome - this is not a language course. Booking deadline July 10th. Are you actually young, strong and adventurous - though you forgot about it? Do you feel stuck in the sofa in front of the television screen? Do you plan a new and more healthy life - from Monday? This is a vacation that will make you discover how fun exercise can be and how great healthy food actually tastes. A kick start for a new and better YOU! Booking deadline July 15th. For those of you who love to be physically active during your vacation we recommend activities like like rock climbing, walking or hiking in our beautiful mountains, bicycling and sailing. And if you love good food and wine - and you probably do! - you'd want to join us for our popular tour of local vineyards, including wine tasting. And why not add a Greek cooking lesson? Though we are only a short bus ride away from some of the best beaches in Greece, a holiday in Kairos Garden is also a holiday for those of you who'd like to do something more than just lie on the beach.